The Old Goat Patrol was established in October 2001 around the campfire of the 13 th Annual Ozark Trail backpacking trip. Bruce Linders, the event organizer, decided to recognize the older gentlemen of our hiking group by presenting them with a patch. He had previously purchased these patches and laid out his dastardly plan even to the point of Making a presentation in front of the whole group. Bruce’s scheme came to be immediately after he had made his normal presentations, awards and handed out trail patches, T-shirts, root beer and such. At this particular moment the group was treated to just one more award “The Old Goat Patrol”. The four goats recognized that night were Fred Finder, trail name Trail Beast, Rich Bauer, trail name Mule, George Goetz trail name Papa Bear and Jim Mc Inroe trail name Ham Bone. At the 14th Annual Ozark Trail backpacking trip the Old Goat organization appointed three more members who had joined our Old Goat hikes and were worthy of Old Goat statue. Appointed in 2002 was Linda Karsch, trail name Martha Moose. Linda is our only nanny goat thus far. David Oelrich, trail name Grid Line and Jack Sullivan, trail name Hitch Hiker. One thing I would like to mention is that most of the trail names were not selected by their owner but rather earned through some related action. 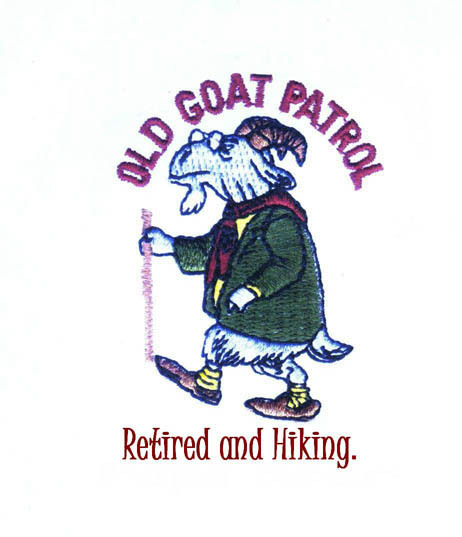 With this new recognition we added Retired, because we were all retires, and hiking because we all liked to hike, made a new patch or logo, embroidered a couple of shirts for ourselves and became the Old Goat Patrol. The group ultimately turned into a second group of senior hikers. Since being established a portion of the Old Goat Patrol have hiked in Minnesota, Michigan, Colorado, Arkansas, Illinois, North Carolina, Tennessee, Virginia, Massachusetts, Vermont and New Hampshire. We try to plan one good trip per year plus all the local hikes we do each year. When you reach 60 you need to hike more, not because it is the healthy thing to do but more because there are so many trails and so little time. One event we all try to do every year is the Annual Ozark Trail each October here in Missouri. The trail needs the support as it develops into one of the long distance trails here in the mid-west. We got our start around the campfires of this event and some have seen the event grow from four or five participants to over twenty. So if you aren’t doing much this October join us for some fun.